Before he decided to join an uprising against India in the disputed region of Kashmir, Owais Malik, 22, was an art student and apple picker. “He was a responsible kid who cared about his studies,” his father, Yusuf, 49, told Reuters. Now Owais is among 400 local Kashmiris who are fighting against what they see as the occupation of Indian-administered Kashmir – a separate struggle from the territorial dispute involving India, Pakistan and China, though the battles sometimes overlap. In the past, militants based on the Pakistan side of the so-called Line of Control have carried out attacks in Indian-administered Kashmir, where 470,000 Indian troops are stationed. Around 50,000 civilians have died in the violence in the past 30 years. Military installations, rows of barbed wire and armed soldiers are common sites in the otherwise beautiful place at the foot of the Himalayas. Fear is rampant, wrote CNN. Recently, Indian and Pakistani jets clashed over the region after Indian warplanes struck at an alleged terrorist training base across the border. That clash followed a suicide bombing in the Indian-administered zone linked to Pakistan-based terrorists that killed more than 40 members of the Indian military in February – the most devastating attack in the region in three decades. The escalating tensions between the two countries, meanwhile, sparked fears of a wider conflict between the two nuclear-armed powers. India’s parliamentary elections, which started April 11, aren’t necessarily stabilizing things. 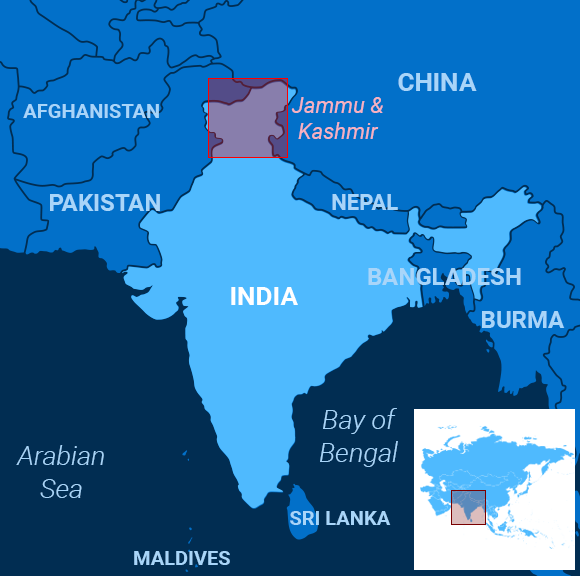 Indian-administered Kashmir is part of the Indian state of Jammu and Kashmir, the only state in India with a majority Muslim population. Since the accession of the former princely state to India after the country won its independence from Britain, Jammu and Kashmir has enjoyed special autonomous status under Article 370 of the constitution that limits federal powers in the state. But Prime Minister Narendra Modi, whose ruling Bharatiya Janata Party is expected to retain power, wants to end that status and repeal rules that allow regional officials to keep new residents from voting in local elections, reported News18, a local broadcaster. As the Globe Post explained, Modi argues the moves would stitch the restive Kashmir Valley into the rest of India. Modi’s political opponents and many Kashmiris view the proposal as a way to give non-Kashmiri Muslims a chance to tip elections toward candidates more favorable to policies emanating from New Delhi. Fearing election violence, turned off by corruption, or not viewing the government as attuned to their concerns, many Kashmiris don’t vote, wrote VICE. Pakistani Prime Minister Imran Khan has rejected changing the rules governing Indian-administered Kashmir, saying United Nations resolutions designed to bring peace to the region depend on them. Speaking to the BBC, Khan called for dialogue on Kashmir but Modi has refused, potentially to project a tough stance on the issue – a vote-getter. Luckily, political winds change. Modi still has time to don the mantle of peacemaker – if he wins the elections at all. Late Tuesday, French President Emmanuel Macron reassured a stunned nation that the devastating fire that ravaged the Notre Dame Cathedral had left enough of the exterior structure intact for the iconic building to be restored. “I tell you solemnly tonight: We will rebuild this cathedral,” he vowed, according to Le Figaro. After repair work on the cathedral roof and the spire sparked a blaze hundreds of feet too high for the city’s most powerful water cannons, according to officials, Paris and the rest of the world watched for horrified hours as the fire spread across the roof and the spire eventually collapsed, the Washington Times reported. The Paris prosecutor’s office ruled out arson and terrorism and said it was treating the fire as an accident. Initial reports have suggested some of the priceless art housed in the cathedral had already been removed due to the renovations and officials have confirmed that the crown of thorns believed to have been worn by Jesus Christ before his crucifixion survived the flames. As the devastation sunk in, Parisians gathered around the city to pay homage to the great cathedral, singing hymns and offering up prayers and singing songs from the musical, “Notre Dame,” USA Today reported. The Taliban delegation to peace talks in Qatar this month will include women for the first time in a bid to address fears that major gains made in women’s rights since the toppling of their regime in 2001 will be lost if they return to power. “There will be women among Taliban delegation members in the Doha, Qatar meeting,” Zabihullah Mujahid, the Taliban’s main spokesman, told Reuters by telephone, adding that they will not be relatives of senior Taliban members but ordinary Afghans. Civil society groups, the Afghan government and Afghanistan’s international partners have been pushing for such a move to prove, as Taliban representatives claim, that the group has tempered its ultra-conservative views. However, the women will not participate in the principal negotiations with US officials, only in interactions with Afghan civil society and political representatives, Mujahid clarified in a tweet. Anyone who fled in the past year and does not have an open court case or formal accusation against them will be eligible to return, the foreign affairs ministry said in a statement, according to the Associated Press. However, the opposition Civic Alliance dismissed the proposal as “absurd,” Alliance director Azahálea Solís said. “It’s ridiculous to act like the exiles would believe the same government that threatened them, persecuted them, killed their relatives and occupied their houses is now going to safeguard their lives and safety,” Solís said. During violence associated with protests demanding the ouster of President Daniel Ortega and a crackdown by police and masked, armed men in pickup trucks over the past year, the Inter-American Commission on Human Rights estimates that at least 325 people have been killed and more than 52,000 have fled the country. H.P. Lovecraft pioneered the cosmic horror genre in the 20th century with his Cthulhu Mythos. Many fans know the story of the fictional, tentacled god sleeping deep within Earth’s oceans, whose grotesque sight can break a person’s sanity. But archaeologists who found Cthulhu’s remains – or his child – in England say he doesn’t look so intimidating, Science Alert reported. Paleontologists discovered the fossilized remains of an ancient relative of the sea cucumber dating back to the Silurian period, when the first bony fishes emerged. Despite being just over an inch wide, the creature was equipped with 45 armored tentacles that were probably used for feeding and movement. In their study, the researchers named the creature Sollasina cthulhu, in honor of Lovecraft’s eldritch deity, adding that it belonged to an extinct class of echinoderm – the group that includes sea urchins, sea cucumbers and starfish. Researchers also noted that the little horror had the first evidence of a water vascular system – a hydraulic system that helps current echinoderms move around in water. Unlike soft and squishy sea cucumbers, however, Sollasina cthulhu had an armored body, leading to speculation that it branched off at one point in the group’s evolutionary history. Or maybe it still lives and is growing to Lovecraftian proportions in the ocean depths.